The Angelus Chronodato. Photo courtesy of analog/shift. The name Angelus might not mean a lot to you if you're new to watches. Yet to those entrenched in this passion, Angelus was one of the greatest manufacturers of chronograph movements. So what happened? Why were Angelus lost to time? Can they rise again? Angelus began when two brothers, Albert and Gustav Stolz, set up shop in the watchmaking town of Le Locle, Switzerland in 1892. To call Le Locle a hub of horology would be an understatement as Tissot, Zenith, Vulcain and Universal can all trace their start to this sleepy Swiss hamlet. Albert and Gustav began making watches and named their brand after the angelus devotion of the Catholic faith. Soon Angelus' work on pocket watches was constantly being awarded gold medals at International Expositions. In 1925, Angelus produced their first in-house monopusher chronograph movements, a manual winding 29.3mm and a 31.6mm. In 1930, Angelus released the world's smallest 8 day movement which was developed in co-operation with Zodiac. This movement was a technological marvel as along with the long power reserve, it was accurate to +/- 1 minute a week. An amazing feat for a watch in 1930 and to this day it remains the smallest movement with an 8 day power reserve ( Infact, the 8 day claim was an understatement as it could actually last 10 days). Two pusher chronographs would become Angelus' bread and butter for the next 30 years. Their first two-register chronographs either used a modified Valjoux (identifiable by the 45 minute register) or their own in-house Calibers 210/215 (Identifiable by the 30 minute register). By 1940, Angelus were providing watches to the Hungarian Air Force, an organisation that wasn't allowed to exist. The Treaty of Trianon forbid Hungary from having a military air force so the Royal Hungarian Air Force had to pose as a civilian flying club (You could say that they had to fly under the radar....). The watches that Angelus provided came in a variety of designs but are all linked by the engraved caseback with the letters L.E for Legi Ero, Hungarian for Air Force. Something unusual about Angelus is that apart from a few exceptions, they rarely named their watches and collectors now refer to the watches by their caliber numbers. The crowning achievement of Angelus was the Chronodato. Every brand has one watch that defines them; Omega has the Speedmaster, Rolex the Submariner and Breitling the Navitimer. Angelus has the Chronodato, the world's first serially produced chronograph wristwatch with a date complication. And not just a date complication, but a date, day and month complication. This chronograph is one of the crowning achievements of mid-century horological design. The Caliber 217 movement was based off the earlier 215 with the inclusion of a calendar module. At 38mm and being quite thick because of the extra module, the watch would have been huge for 1942 but it's perfect for modern wrists. The two apertures above and below the central pinion is a novel way of displaying the day and month without hindering visibility of the chronograph registers. The wide variety of case materials, along with different dial variations, make collecting the Chronodato so enjoyable for enthusiasts. Like vintage Omega Seamasters, there is a plethora of different designs that suit anyone's tastes. Angelus would sell the Chronodato under their own name but also produced it for brands like Minerva, Augustus, Alpina and Abercrombie & Fitch. 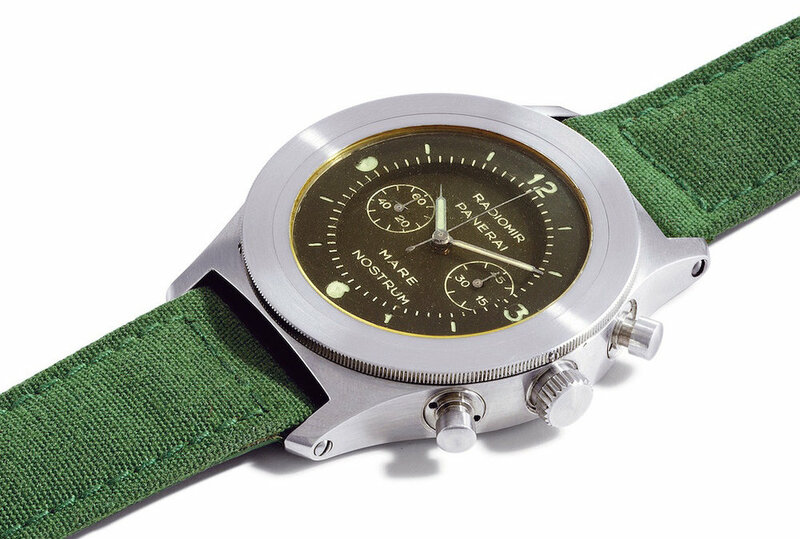 A Panerai Mare Nostrum that went up for sale in 2005. Photo courtesy of Christie's. One of Angelus' greatest achievements was a watch they didn't make. Whether you love or hate their modern pieces, the history of Panerai is fascinating. Some of the world's best watchmakers produced movements for them, allowing Panerai to pivot from making depth gauges to making watches. The most important Panerai with Angelus movement is the Mare Nostrum. Mare Nostrum, Latin for Our Sea, is a phrase dating back to the conquest of Egypt and Spain by the Roman Empire and in World War II, it referred to the Mediterranean waters were the Italian Navy operated. Created in 1942 as a deck officers chronograph, the Mare Nostrum was a hulking 52mm beast with the Angelus Caliber 215 beating within. It was the first chronograph that Panerai ever made but the Allied invasion of Italy in 1943 put an end to the production. Only 2 or 3 prototypes were ever made, making it one of the most desirable Panerais ever made. There have been several re-editions of the Mare Nostrum over the years but in the eyes of collectors, nothing holds a candle to the original. An original photo of the Panerai Mare Nostrum. Photo courtesy of Panerai. In the 1950s, Angelus began experimenting with new watch complications. The Angelus Tinkler with gold hour markers. Photo courtesy of Matthew Bain Inc. The 1950s were a true golden age for mechanical watches. Brands experimented with new complications and case designs and dive watches became a thing. Despite being known for chronograph models, Angelus produced two watches that were unlike anything they have made before; the Datalarm and the Tinkler. The Datalarm, released in 1956, was the first wristwatch with both an alarm and date function. The watch used an Adolph Schild alarm module, used by brands like Tudor and Omega for their alarm watches, with a date module mounted on top. There are several different versions but the rarest is a world-timer dial with a 24 hour chapter ring. Two versions of the dial exist with different cities printed for the +1 timezone, either Paris or Stockholm. 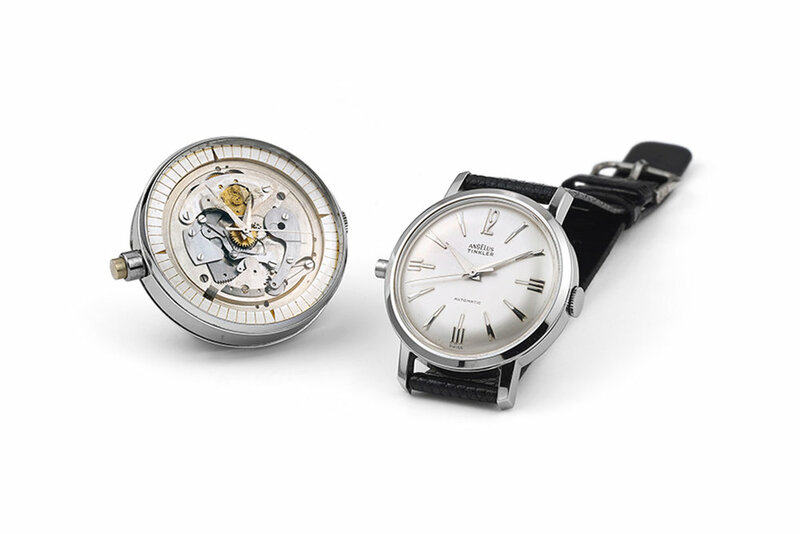 The Tinkler, released in 1958, was the first automatic repeating wristwatch (It was also the first waterproof repeater). If the Chronodato was the crown jewel of Angelus then the Tinkler was supposed to be a grand palace to showcase the technical achievements of Angelus. Yet the good King Angelus was too ambitious. The Tinkler was more complicated to make than they first thought so production ran over budget despite only 100 being made. When it launched it was a commercial flop. Calling one of the most advanced wristwatches of the era the Tinkler probably wasn't the best idea. The company would continue making watches until 1978 but never again with an in-house movement. From now on they would only use movements from ETA, Adolph Schild, Felsa, Peseux or Valjoux. Why one of the most respected chronograph manufacturers stopped making chronographs is unknown. If I had to guess, I'd say that the expensive and complex production of the Tinkler drove Angelus into the red. Maybe the decision to end in-house production was intended as a temporary measure to recoup the money on the Tinkler. If that's the case then it soon went from a temporary measure to a permanent hiatus. Over the next two decades, Angelus would keep on making watches in partnerships with other brands but in the 1980s, they closed their doors for good. Like a fading handprint on a window pane, Angelus lingered for a moment before disappearing. The decline of brands like Wittnauer and Universal Geneve in the late 70s and early 80s is easy to understand. Cheaper competitors upstaged them both by making quartz watches an affordable necessity and mechanical watches an unaffordable indulgence. But Angelus had already left before quartz had even begun to threaten Switzerland, making their departure even more baffling. It started with a phone call. Sebastein Chaulmontet, Head of Movement Development at La Joux-Perret and avid collector of chronographs, picked up the phone to someone offering to sell him Angelus. A week later, Chaulmontet had convinced the CEO of La Joux-Perret to buy the fallen angel of chronograph manufacture. After two decades of horological purgatory and four years of R&D, the new Angelus was reborn with the U10 Tourbillon Lumiere. This immense timepiece had a manual wind movement, dead-beat seconds and a one minute tourbillon suspended on the right hand side of the case. 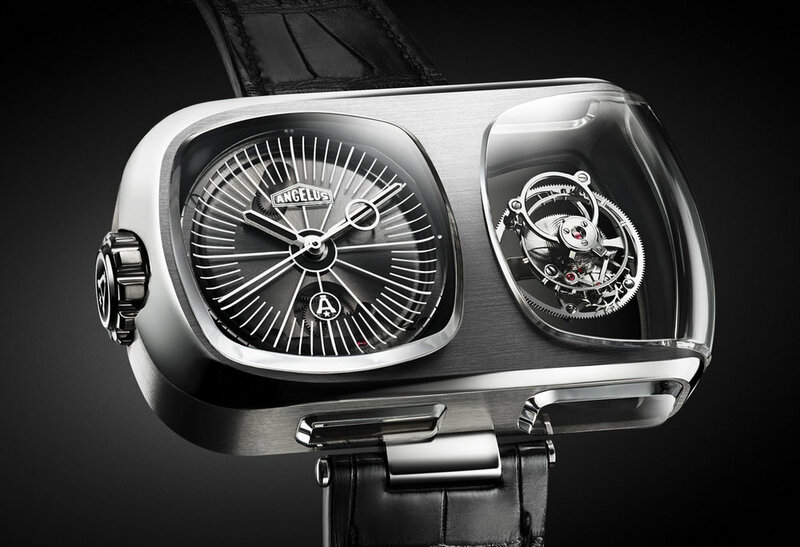 It was pure haute horology and nothing like Angelus had ever made before. 62.75 mm x 38 mm x 15 mm with 7 sapphire crystals. Photo courtesy of Angelus. Power reserve, hacking seconds and a flying tourbillon. Photo courtesy of Angelus. Msr. Chaulmontet did have an explanation about why his new Angelus was so different than what people were expecting. " I don’t want to produce something that, technically, could have been made 80 years ago – I wanted the best technology we have right now. That meant working with big curved sapphire, a 3D movement and curved movement plates. 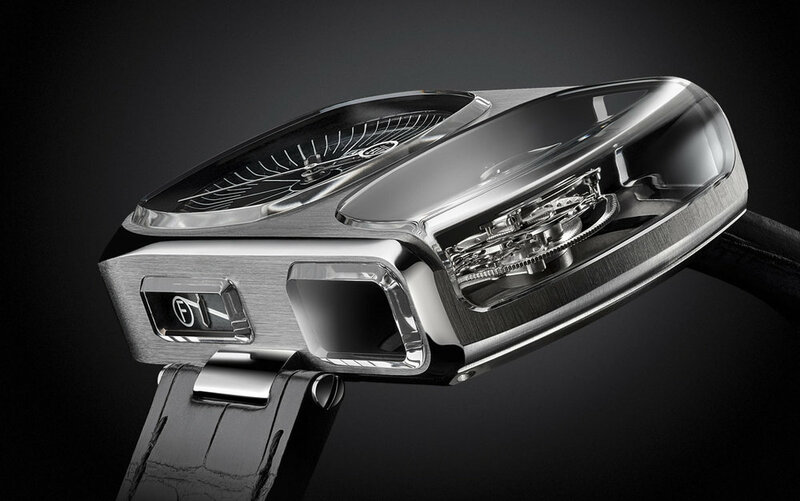 We wanted to re-launch Angelus as a modern, innovative, contemporary watchmaker". I have to respect Msr. Chaulmontet and his willingness to create something different. It would have been all too easy to recreate Angelus as another heritage brand releasing old designs with ETA movements. Whatever you think of the new direction that Angelus has taken, you must concede that they are original. They may not be affordable, they may not be chronographs but they are certainly horological works of the highest order. If you're interested in collecting Angelus watches then I cannot recommend enough this collector's guide by Dr. Christoph Öhm-Kühnle. It's a truly excellent piece of literature that any collector should read. Thanks to analog/shift for the excellent photos of the Chronodato chronographs. Fratello Watches: #TBT Angelus Caliber 215 Chronograph L.E.